We’ve spent quite a bit of time observing nature this week. The older girls I homeschool are in the middle of a project for Biology. They are observing plants, birds, trees, animals—whatever they can find and making a notebook for their end-of-the year project. The younger crew found this dead dragonfly on the deck and enjoyed it for quite a while. Many birds have been seen. The crazy woodpecker gave entertainment, along with ducks, geese, blue jays, robins, Rufus-sided Towhees, crows, and many more. The flowers are blooming like crazy and the garden is growing like mad! It’s a great time to be outdoors! I go out as often as I can, even if I have to dodge raindrops! Trust me, there’s plenty to do!! That weed is purslane, and I continue hoeing it out–the purslane in the picture is gone now, thank goodness–I have been hoeing. The garden is sure loaded with it. I no sooner get it out then a new batch comes up. Today, when we took our daughter and niece to their Driver’s Ed class, we were amazed to see a mama goose had decided to make a nest right outside the office buildings where the class was held. Nestled into the dirt of the flowerbed, this goose has decided that she is hidden enough behind the tiny, green bush. Daddy goose wandered the parking lot. He wandered around the Driver’s Ed cars, the downed branches and trees from the recent wind storm, and away from my daughter and nephew, who were trying to get a closer look. We were a bit early, but soon 20-30 teens arrived and filed past near the nest. Mama goose put her neck out and looked a bit nervous, but stayed put. We talked to a man who was waiting for his teen’s class to start, and he said the mama goose had stood up and there were eggs under her. Today, we packed a picnic lunch and stopped in Oregon City at Clackamette Park to eat it in between some errands that had to be done before we move. The river was teeming with ducks and geese, and fishermen. I walked down a closed boat ramp for a closer look. I saw more than one family of geese, but this one was polite enough to swim right over to where I was taking pictures. We really enjoyed watching the moms and dads swim with the babies safely bobbing along between them. Ja’Ana especially enjoyed eating her lunch outside, jumping from rock to rock with her sandwich in the beautiful weather. Who says only the birds feel free on a day like this? Today was a typical spring day in Oregon. For a good part of the day, the skies alternated between patchy clouds and dark gray clouds followed by some of the strongest downpours we’ve seen lately. As we drove the girls home today from their various commitments, a gorgeous rainbow led us home. It was one of the most vibrant rainbows we have seen for a very long time. This picture does not do it justice at all, but it was striking. At times it was a double rainbow. The girls in the van even looked up from their phones and other electronics long enough to exclaim in wonder at the beauty of this rainbow. Then, as we entered our house, the first thing we saw out of our back deck window was these 3 deer, enjoying the lush green grass in our pasture. They stayed for quite a while, and we watched until they finally wandered out of sight behind the trees. It was a lovely ending to our evening. On our recent trip to the Oregon Coast, we were taking a scenic drive in-between rain showers and pulled into a view point to just sit and watch the majesty of the Pacific Ocean. Rob was able to capture this photograph of a seagull perched on this sign. We thought it was rather funny as seagulls are always trying to get people to feed them old bread and it seemed like he was warning us to not leave any unattended! Unfortunately for him, we had not come prepared this time with any scraps for the birds. Later, when the rain cleared for a few hours, we were able to get down onto the beach and enjoy seeing more gulls. Even though they are one of the most common birds at the beach, we never get tired of watching them. When we got too close, they took flight, heading off away from us intruders who had dared to invade their patch of the sand! One of the most interesting things I like to do is to watch wildlife. Recently, our family has been treated to the privilege of watching this Pileated Woodpecker, who has decided to settle into a tree very near our garage. For hours, our new-found friend can be heard tapping, pecking, even hammering on the dead tree he has chosen. 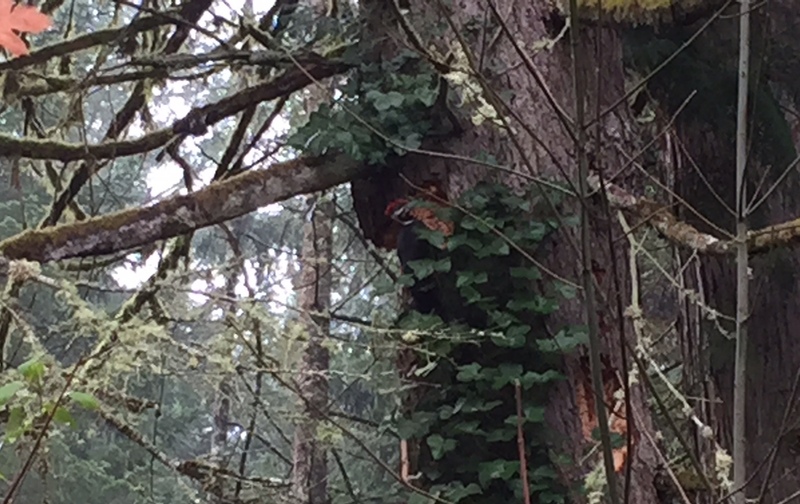 According to the Audubon Society Field Guide to North American Birds, this woodpecker likes to eat carpenter ants. It hammers holes into the dead wood, and then uses its extremely long tongue to get the ants out. After reading the description in the guide, I decided that this must be a male, because the male has more red on it then the female and is brighter, and more showy, as male birds often are. This bird is certainly bright and showy! His red crest shines out with a brilliance that is not equalled by the bright yellows and reds of the changing leaves that surround him during this time of year. At first, the bird was wary, furtively scooting to the back of the tree whenever one of us came outside. Now, he is not so cautious, and just continues his staccato feast when we walk nearby. The only thing that seems to unsettle him anymore is when the cats creep too close. Somehow, he seems to be able to tell that we love the fact that he is eating carpenter ants, but the cats just want to eat him. I don’t know how long he will stay. Probably until the ants run out or until he finds another dead tree loaded with insects. I hope it’s for a while, though, so I can continue to enjoy his presence and share it with the children. It’s a privilege, indeed, for them to grow up surrounded by such a sign of how the Creator made each animal and bird to fulfill its part in this world, and I’m glad we were treated to such a display. Bird watching can be a good activity to do with kids. It helps if you can capture a photograph of the bird so the picture can be examined closely and compared to the descriptions and photos in the bird guide. It’s like a treasure hunt, each one searching for the right match, until one calls out “It’s this bird. I’m sure of it!” Then comes the inevitable arguments until everyone agrees on the name of the particular bird. This can take quite some time at our house. It is helpful to have a bird guide, a digital camera or phone, and binoculars. If a child, or adult, wants to keep a list of birds they have found, an album could be made to put the pictures in. Also, there are books that are sold for people to list their “finds” in, if a list is what’s desired. Our family would not be considered hard-core bird watchers. We occasionally try to identify birds that cross our path in our daily routine. It has been a fun, frugal and entertaining hobby for many years.